Coma Berenices is rather unremarkable and goes next to the Lion and Bootes, its neighboring constellations. You can see this constellation rather as collection of faint stars, only two of which reach the size class 4. The constellation Coma Berenices is on the spring sky between the Lion and Bootes. Many of the stars here originate from an open star cluster 260 light years away. In the direction of the Berenice is the so-called "galactic North pole" of the Milky Way. 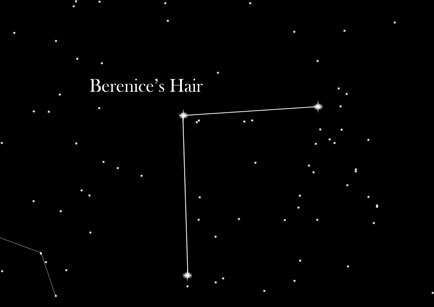 The Coma Berenices is not a mythological constellation, because it was late to be assigned as a separate constellation. The Berenice itself actually lived - and is thus not a mythological figure. Berenice should have at that time cut off her long, beautiful hair, so her prayer for her husband's safe return from the war might be answered. The following day however, the hair was gone from the temple in which it was kept. The gods were so happy about this hair, that, as an honour, they placed it on the sky.